The Allegro restaurant, recently renovated, is offering you an international cookery and showcases local products. The four seasons outdoor pool and the gym are situated on the 3rd floor of the hotel. The gym is open 24/7. For the best lunch of your life, the restaurant Le 23, situated on the 23rd floor, is offering you an urban buffet including the best view of Quebec City. The executive association is also situated on the 23rd floor and is offering you the best service in town including: janitor service, evenings (5-7) including non alcoholic beverages and couches, deluxe continental breakfast, and the best panoramic view of Quebec City. 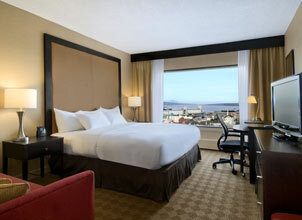 The Hilton Quebec is the best hotel for your future stay in Quebec City.